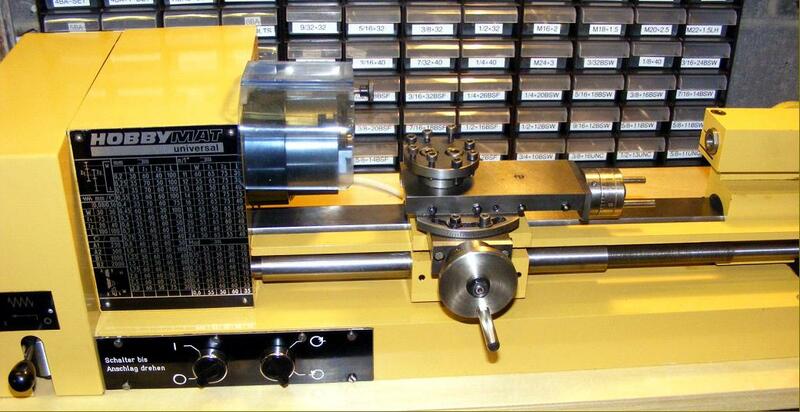 Hobbymat Lathe and milling machine manuals can be ordered on-line here. Made originally in what used to be "East Germany", by VEB Prazisionsdrehmaschinen (now, Unitech) the Hobbymat MD65 Universal (as it was known in the UK) and BFE vertical milling attachment and stand-alone miller were also marketed in the USA as part of the Prazimat range - and in parts of Europe as the Saupe & Sohn and Proxxon. The lathe was also made in a wood-turning version as the MD120 (described here) - this too being branded in a number of different ways. During the early 1980s the Chinese made an exact copy of the MD65, (even to painting it the same shade of yellow) - however, it can easily be distinguished from the real thing by its use of a very heavy cast-iron base-plate, poor detail finishing and a lack of standard accessories. The Bulgarians also got in on the act with the ZMM Company offering the green-finished "Hobby 120 Sliven" - a machine based on the MD65 but with a number of significant differences including a round main bed with no flat, the carriage being stabilised by small diameter, bed-length bar to the rear. 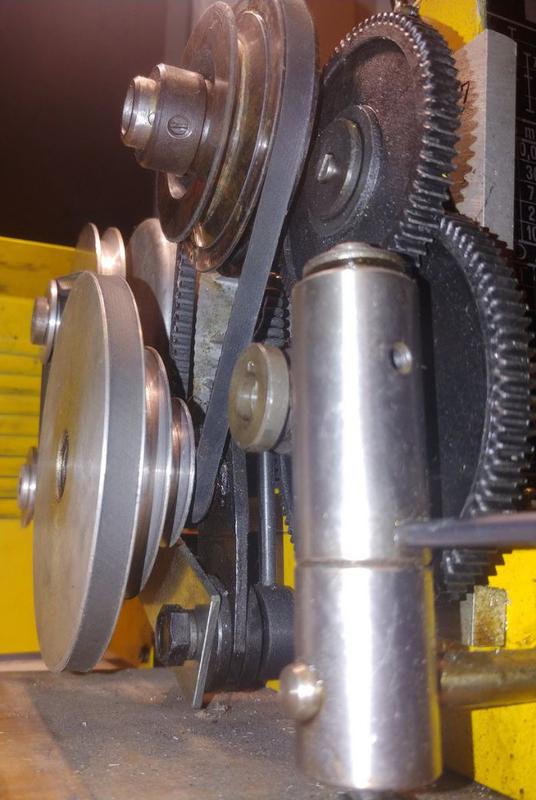 The supporting baseplate and headstock were in cast iron and, in place of the MD65's standard 8 mm V-belts (the correct type can be ordered here), narrow 5 mm Gates type were employed - this change necessitating alterations to the changewheel drive. One notable improvement was the use of a very much more robust lever assembly to engage and disengage the leadscrew dog clutch. 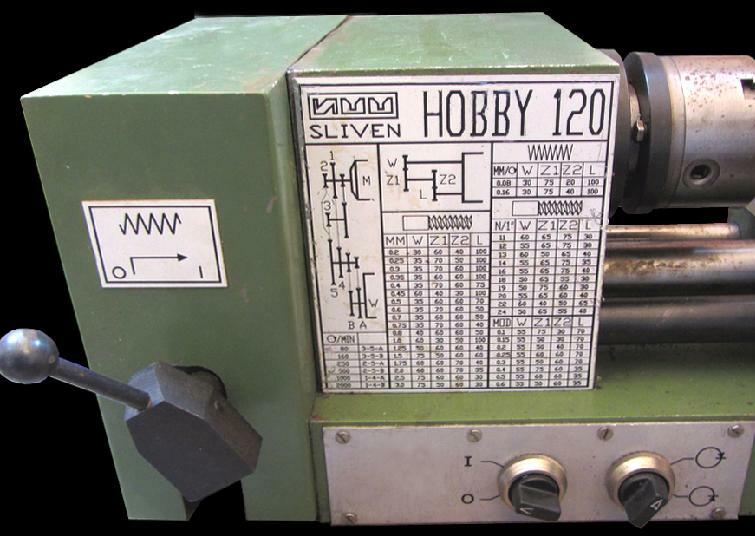 If you have a ZMM Hobby 120, the writer would like to hear from you. 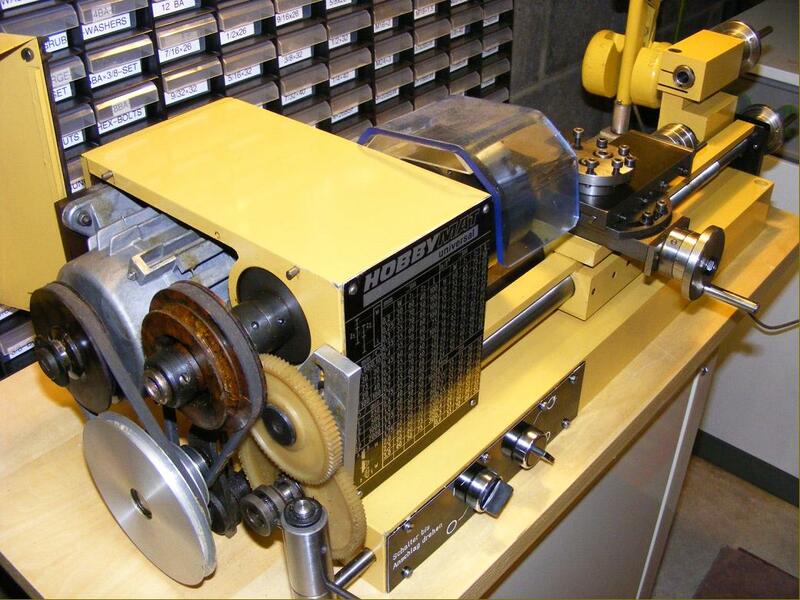 A neat, well-designed little lathe of 65 mm (2.6") centre height by 300 mm (12") between centres, the original Hobbymat found great favour amongst the makers of smaller models, jewellers and watch repairers - and has long proved a very-popular second-hand buy. While the bed was steel - and formed in the manner of a Geneva-pattern watchmaker's lathe being round with a flat section along its full length at the top - the supporting base-plate was in aluminium. 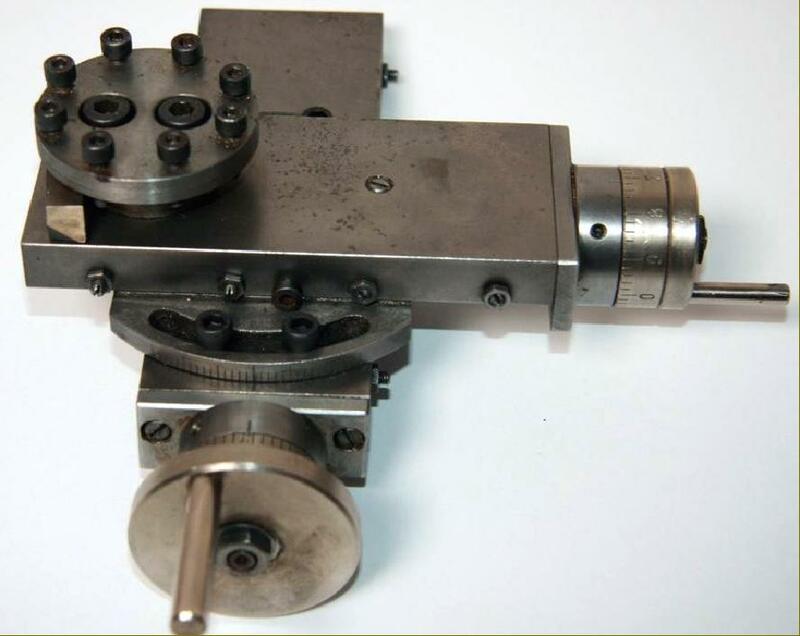 There were four spindle speeds from 250 to 2000 rpm and, although provided with changewheels and a leadscrew, the high bottom speed rather mitigated against attempting to use the lathe for screwcutting - unless you employed the inexpensive third-party supplied "low-speed" pulley assembly. These are available from time to time - please see this page for details. Held in place by a rather inconvenient 3-stud bolt-on arrangement, chucks are found with three different recess diameters: 55 mm and 56 mm each with M6 bolts, and 63 mm with M5 bolts. The most common is the 56 mm, originally fitted with a Polish-made 3-jaw chuck identifiable by a single key hole. The 63 mm recess units had a chuck of TOS manufacture while the rarest version, the 55 mm, was fitted only to very late-model examples. 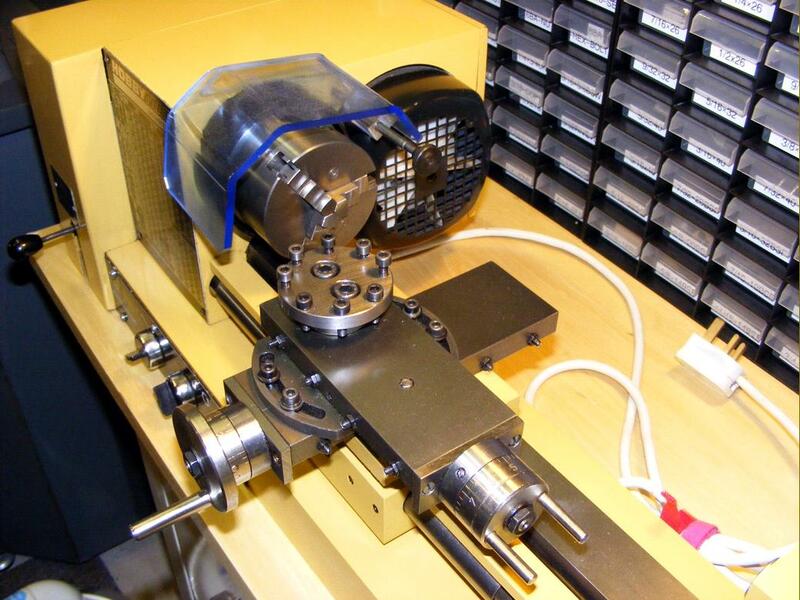 A very useful and well-made 4-speed powered vertical milling head was also manufactured (it was mounted on back of the lathe bed) and turned the lathe into a compact "machining centre". Like many other Eastern European products made under communist-control during the "Cold War" from the 1950s to the 1980s, it was effectively sold at a loss to obtain Western currency and was, therefore, something of a bargain - especially as it was so well equipped. 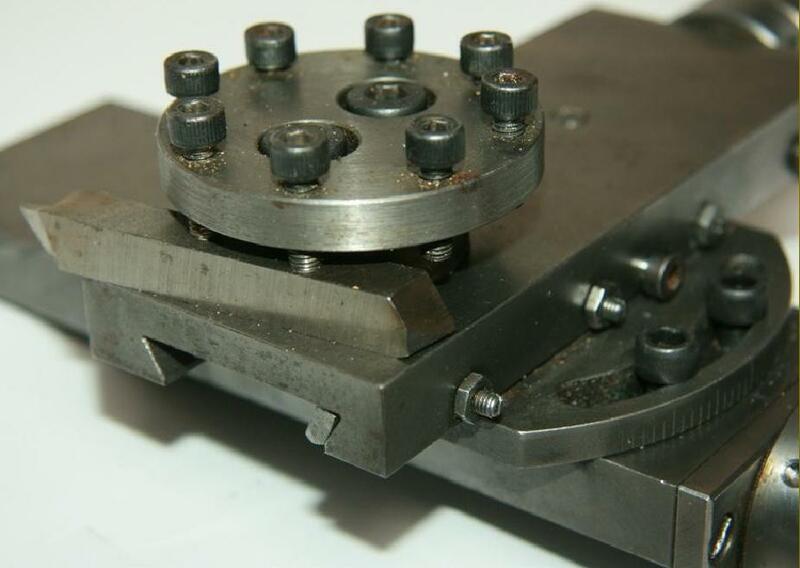 Supplied as standard were: a compound-slide rest, 3-jaw chuck and guard, standard and rotating centres, machine vice, angle plate, tailstock chuck, changewheels for screwcutting, spanners and even a set of screwdrivers - but no faceplate. A set of changewheels consisted onine plastic gears of: 30t, 35t, 40t, 50t, 55t, 2 x 60t, 2 x 65t, 70t and 100t - these gears are usually in stock and can be ordered here. With German re-unification, and the arrival of the West German Mark, the company could no longer compete at the lower end of the market and production stopped for several years. It has recently resumed and both the lathe - now somewhat modified and known as the BFW300, together with its optional milling head - and a complete milling machine are once again available. Fitted to a light baseboard with handles a Hobbymat can just about be lifted on and off a bench by one man - or very easily by two - making it ideal for situations where space is tight or the machine will be only be brought out for occasional use. 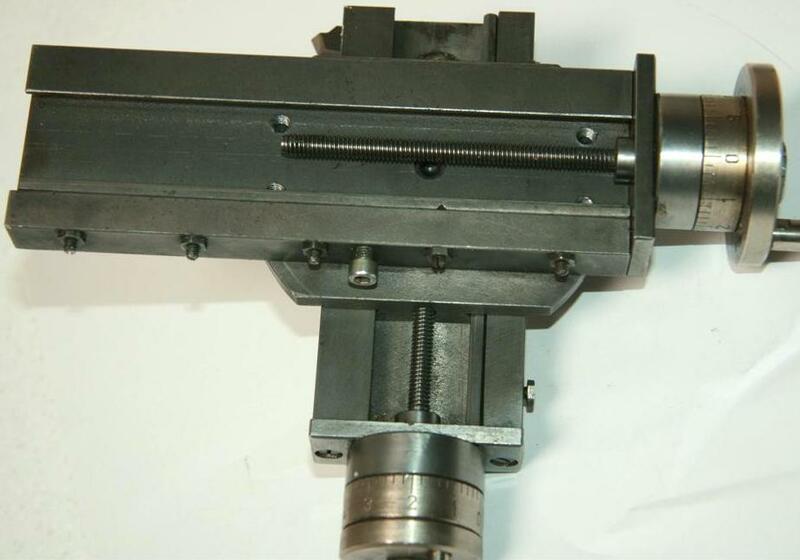 There are few problems with the machines, but the method of locking the carriage and tailstock to the bed, and the setting of the all-important "limit screws", must be understood if over tightening and cracked castings are to be avoided. An examination of the parts will show that each (carriage and tailstock) are split along their underside with two socket-headed screws, arranged side by side, passing through the slot. One of the screws (the stop) is arranged to bear against the inside face of the slot - and so limit the amount the other screw (the compression screw) can close up the gap. Having established which is which, loosen both screws so that the casting slides easily along the bed; tighten, a little at a time, the compression screw until the casting locks to the bed. Now screw in the stop screw until it just bears against the inside of the slot. Slacken the compression screw to see if this allows the casting to slide--it should. Now tighten it again, without undue force, to check that the casting locks. If not, back of the stop screw 1/6th of a turn at a time until it does. It may be that in service, with the forces involved, the castings can still move a little; if so, back off the limit screw by one 1/6th of a turn and tighten the locking screw - that should solve the problem. The MD65 is a small, light lathe and it will not tolerated ham-fisted operation or the clumsy over tightening of fittings. 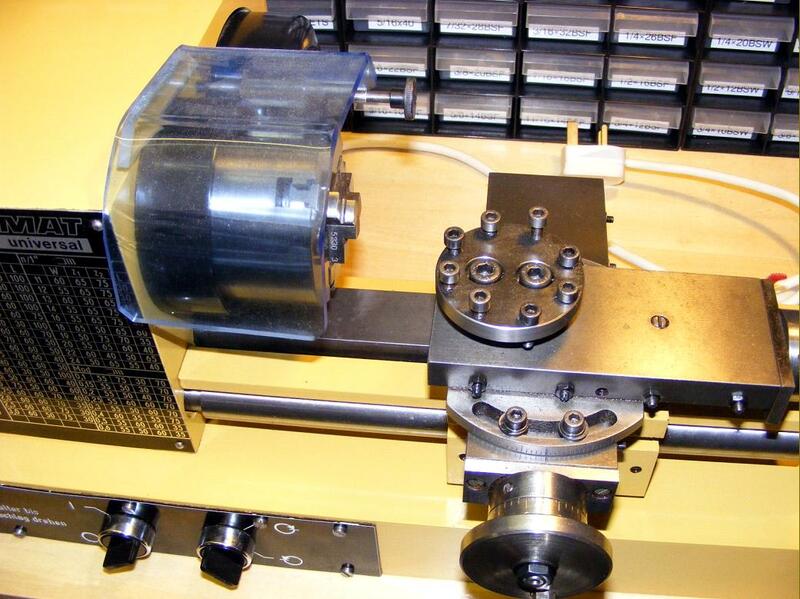 Prior to 1990, lathes were fitted with two rotary electrical switches with a rather sticky, stiff and imprecise action; subsequent models were improved with one rotary and two push-button controls. The same vertical milling head with its 315, 560, 900 and 1600 r.p.m. 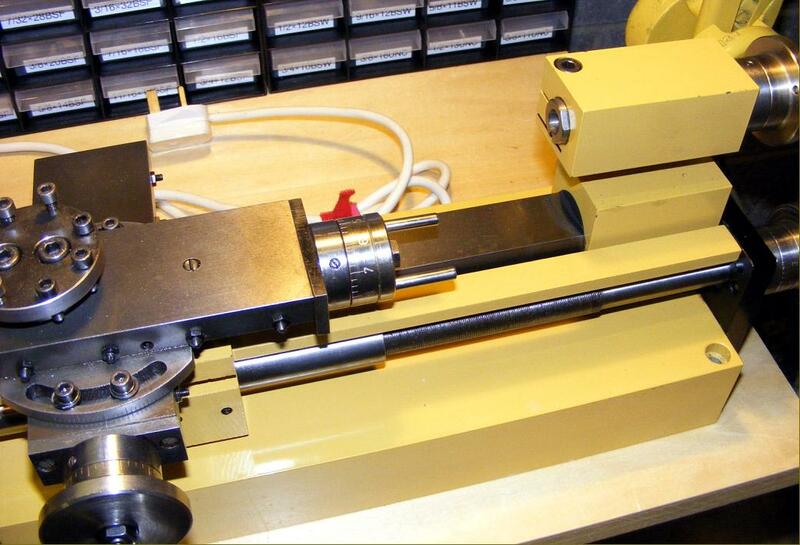 speed range was used on both the MD65 lathe and very useful compact stand-alone BFE vertical miller. When set up as an independent unit, a 160 mm x 450 mm co-ordinate table was employed, equipped as standard with rulers on each axis. Early heads were very reliable, with reports of them being in continuous service for over 25 years, Unfortunately, heads made after approximately 1992 were fitted with "improved" plastic gears in place of the earlier fibre type and theses can suffer from loose bushes that allow them to slip down and partially engage the face dogs of those beneath, so locking the drive. Fiddling with the control levers and twisting the spindle backwards and forwards usually enables the machine to start up again - and run in an apparently normal manner. Even if stopped and started several times the symptoms may not reappear so, if you are contemplating a used example, warm the miller up by running it for ten minutes on top speed and then do a stop-start test at least a dozen times on every speed. Only then should you accept it as satisfactory. However, should the fault be present it is not fatal and the bushes can be easily 'Loctited' back in place - though dismantling and reassembling the head is an awkward and time-consuming job. To keep the head in good working order regular greasing of the gears - and the selector forks - is vital. Two interesting points concern the mounting of the vertical head within the bracket that fastens to the back of the bed: the bracket bolts into place, and can be adjusted by two screws each of which bears against a dowel pressed into the bed, so as to tilt the column left or right, but not towards or away from the operator. Hence, should the column prove to be out of line in a fore and aft direction, the only solution is to shim the bracket mounting faces at the top or bottom. Closed down onto the column by two cap-head screws, the support casting employs a third screw acting to spring it open slightly to aid removal (rather in the manner of the tailstock and carriage fitting to the bed). If these screws are mishandled the block will be cracked - therefore any adjustment should be approached with caution..